If you are looking for information on the Rockn Joe franchise business opportunity, Rockin Joe franchises or Rocking Joe franchising, then you have come to the right place. Welcome to Rockn' Joe Coffeehouse and Bistro - It's all about the music. Unlike stale theme restaurants, where the experience runs its course after just one visit, Rockn' Joe is the place you want to come back to. It is your local place to listen to fun, upbeat rock music, from an eclectic collection of music over the past 40 years. There is no rush to leave a Rockn' Joe. In fact, the place has been designed specifically for you to linger and enjoy the friendly atmosphere, listen to great music and sample a wide variety of food and drink. Our Coffeehouse and Bistro - now franchising in the New York metropolitan area - is the place to hear all the greatest tunes, while we serve you up a superb array of specialty coffees and sandwiches in the most casual and cool atmosphere. C'mon in and see what we are all about. Since 1993, Rockn' Joe has thrived as a coffee house and bistro. Now is your turn to enjoy the fun and excitement of running the coolest business in town. As a member of the Rockn' Joe team, your success is our success. To that end, we offer you one of the finest support networks in the franchise industry. Over the years, we've done all the testing - all the trial and error - in making our menu the best around. All of our delicious drinks, sandwiches, desserts, and salads are generously portioned and attractively designed. Few coffeehouses can offer this combination of food, drinks, dessert and fanatical approach to service. 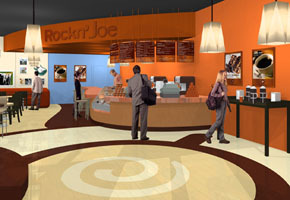 Rockn' Joe franchise owners enjoy being extremely creative, expressing personality and taste. Franchisees can use all, or parts, of their own music and memorabilia collections. For example, Kevin Brennan's flagship café includes music and album covers from Paul McCartney, Billy Joel, Peter Frampton, David Bowie, Blondie and The Who. And among the treasures adorning Kevin's walls is an autographed guitar, personally given to him by Peter Frampton. Rockn' Joe is truly different. And our uniqueness comes alive in our corporate identity and logo. The designs are the brainchild of Kevin Brennan, and represent all that Rockn' Joe is about. You'll be trained in all aspects of our signature brewing procedures and food preparation, as well as administrative, office matters, and sales and marketing techniques. You'll receive unparalleled on-the-job training at our headquarters site, as well as training at your own location, prior to, during, and after your grand opening. This is the Rockn' Joe "Bible," with all of Kevin Brennan's steps to running a thriving business. This "how-to" guidebook contains much of the information and recipes you'll need, in an easy-to-follow format. It's an invaluable tool, one that will help you keep your Rockn' Joe franchise running smoothly and efficiently ... for years to come. The three most important words in real estate? Location. Location. Location. We'll provide you with guidelines and specifications for retail space and we'll assist you in selecting a winning location for your Rockn' Joe franchise. We'll supply you with attractive, highly professional consumer marketing and advertising materials, as well as promotional and publicity ideas, which you can implement right away. And remember, the rock music and memorabilia in your restaurant will be an excellent promotional vehicle, helping you standout from other businesses. Rockn' Joe employs a full-service public relations/marketing firm, Jaffe Communications, Inc., which can be used at your disposal for event planning, to help advertise your store and steer your marketing campaign. We're always available during business hours to answer your questions and address your needs. You'll regularly be visited by a Rockn' Joe field representative, and we'll continually monitor your business, offering advice and support, to increase your sales, attract/retain employees and how to maintain profitability. Why Rockn' Joe Coffeehouse and Bistro? Since 1993, Rockn' Joe has been constantly defining and perfecting its "coffeehouse concept." We have created an all-day approach to the business. Rockn' Joe has three specific components; together they generate sales throughout the entire day, everyday. By offering products your customers desire throughout the day and evening, we aim to generate an ongoing stream of revenue. Use of the trademark Rockn' Joe name. Proprietary coffee products from Rockn' Joe. As a result, our Franchisees can be assured of the highest quality coffee, procured from estates worldwide and roasted by our Roast Master to Rockn' Joe specifications. Corporate purchasing power. We have national accounts with vendors, saving Franchisees money and relieving them of having to negotiate. Equipment and furniture specifications, as well as a list of qualified, approved vendors. Interior designs, including space layout, complementing colors, and a well-designed atmosphere. Corporate manuals, providing step-by-step instructions for procedures, recipes and marketing. Training. We require Franchisees to undergo an initial 21-day training course. In addition, phone consultation, site visits and email consultation are readily available. On-going product development. We are constantly developing new products and programs for our Franchisees, allowing them to devote their efforts to operations. Total Support. We never forget the Rockn' Joe brand belongs to all of us! Your success is our success.